Every so often I get the opportunity to test a product that excites other people in my family. Isabelle is usually the beneficiary of most of my product reviews, but this time, my husband was all in to try a water toy that brought him back to his youth. This is the Slackers Slide & Surf. I should preface this review by saying that 33 year-old men should NOT be using this outdoor toy (it's recommended for kids 5-12); he also weighs more than the restrictions on the box. But for the sake of nostalgia, he decided to be the guinea pig. The Slide & Surf definitely got his approval. And hey, if you can impress an adult with a kids' toy, there's no doubt in my mind the targeted consumer would be over-the-moon happy. The Slide & Surf is a 20-foot vinyl strip, complete with a padded launch pad, bumpers with water holes and an area at the end where water pools and creates a splash. Setup for this one was very easy -- inflate the padded areas, secure the slide to the ground and attach the hose to create the fountain effect. 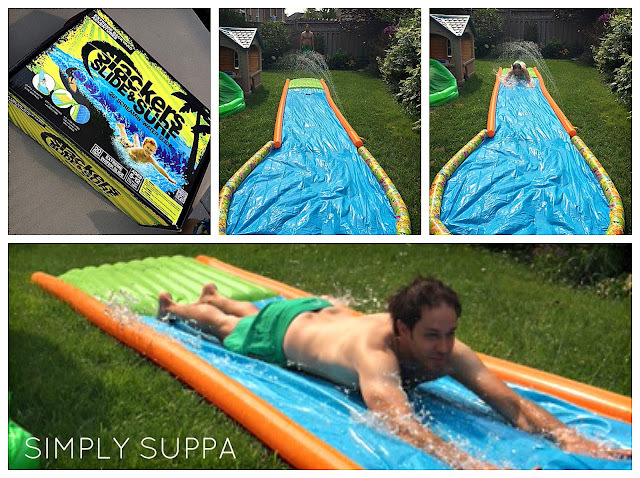 It's best to use the Slide & Surf on a large piece of soft grass, free of any rocks or uneven ground. You want enough room to run before your start your slide, and equal space at the end to prevent injury. True to its name, you can also surf aboard the slick surface (using the Slackers Skimboard, sold separately). Our favourite feature of the Slide & Surf has got to be the misting side walls, which ensure the slide stays wet and extra slippery. When I was a kid, I recall this challenge, and our solution was to run the sprinkler simultaneously! This is a convenient improvement. At the end of the day, the Slide & Surf delivered what it promised: endless fun and ease of use. It's also great to see a modern adaptation of a toy we enjoyed for years as kids. The Slide & Surf is available at Mastermind Toys. Simply Suppa is giving readers an opportunity to win a $50 gift card to Mastermind Toys. To enter, complete the Rafflecopter below. We love the water parks! It's so much fun and keeps us cool! Swimming! And love this slide! Looks like so much fun! This is awesome thanks for sharing! My fave summer activity is camping. I like going on runs & hiking. We love to go to the beach in the summer and hunt for sea glass! we love splash pads, safe and fun! We do a lot of speed boating, pulling the kids behind in the tube. So many laughs. It's awesome!